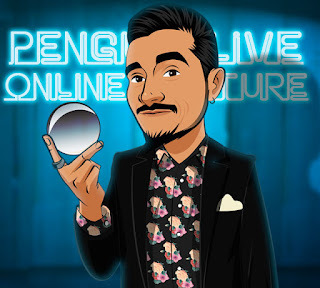 Only at Mentalism Center your will get not just the Penguin Live Lecture but also the full show done at P3 studios with written commentary so you can learn the WHY´s and not just the HOW´s. Who is he? Pablo Amirá is a Chilean Mentalist, Psychologist, Founder of The Mentalism Center, a Creative Consultant and an author of several different releases and effects. This lecture is called “Minimal Mentalism”. You will learn not only 8 direct and simple effects but also a lot of my conceptions about Mentalism and Creativity. Dermovision: Let a participant experience a strange moment with just 5 ESP Cards. "Pablo is one of my truly special Students. Over the years he has helped shape and change the way mentalism is viewed and performed." "I know Pablo personally and, besides being an absolutely marvelous and kind person, he is an incredible originator who never stops thinking." "I've very much enjoyed watching Pablo Amira develop, in less than a decade, into one of mentalism's most creative and prolific authors. I highly recommend his material. He is a man to be watched. He's also one of the nicest guys in the business." "Pablo is one of my all time favorite thinkers. He is brilliant." "Pablo Amira's work is always interesting and fresh. His subtle mix of techniques results in interesting premises, methods and effects that are fun and entertaining for any audience. He has a wealth of knowledge spread over a variety of subjects relating to mentalism - Pay close attention if not you'll miss out!" "Pablo Amirá is a very prolific author and a busy performer. His works are the perfect combination between simplicity and amazement. He knows how to connect with people giving them experiences that they will never forget. A lecture from Pablo is something not to be missed and he is also a great guy!" "I'm SO excited to hear that Pablo is finally doing a Penguin Live Lecture! This amazing performer not only has a vast array of amazing material that you WILL use, but I know that he will offer the kind of insights and thoughts that only a real mentalist could! I expect that MY working repertoire will have many new additions following this anticipated event, as will yours!"